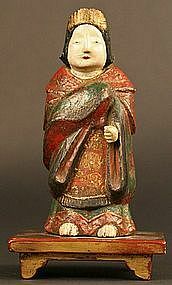 Rare 18th Century Edo Period Japanese Hai Hai Gosho Ningyô. 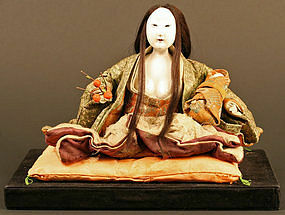 This extremely rare form of Japanese Doll is one of the most sought after of Gosho Ningyo (Palace Doll). It has a wonderful classic painted face. They were presented to Royalty and upper class at the birth of a baby, and placed in the baby's chamber to protect from and absorb bad spirits. 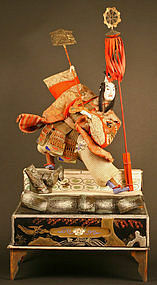 It is covered with many layers of Gofun (Oyster Shell Lacquer) over papier mache. The hair is made of silk. 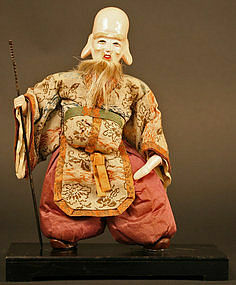 This amazing form is wearing a brocade bib and matching hat, and is holding a Din Din toy. 13 inches (33cm) long, 7 inches (18cm) wide. 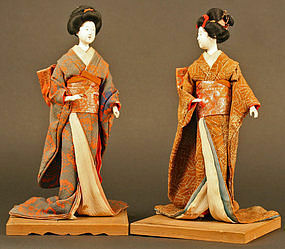 A set of Three Meiji Period Japanese Isho Ningyo of rich, stylish young ladies viewing a book of leaves. They are created in a very unusual style. We have not seen anything like these before. They are gorgeous in every way. A work of art that transcends the usual. 7 inches (18cm) high. Wood base is 15 x 8.25 inches, 38 x 21 cm. Excellent Condition. 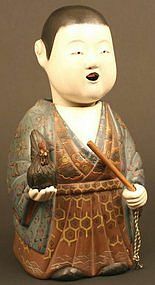 A very large and elaborate Meiji Period Takeda Ningyo of a Kabuki actor in the role of the great warrior Akechi Mitsuhide, who rose from a lowly farmer to become one of history's greatest samurai. 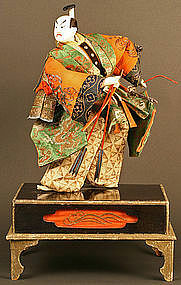 This Ningyo is in Excellent Condition and is complete, which is amazing considering its complex construction. 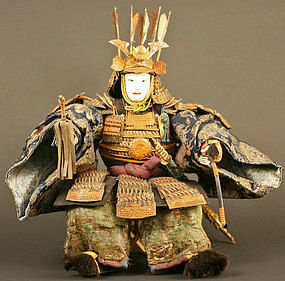 It was made in northern Japan, giving him him a unique look, as most Takeda Ningyo were made in Kyoto. Total dimensions: h31.5 x w16 x d11 inches, h80 x w40.5 x d28 cm. 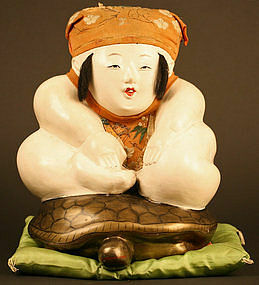 Figure height: 14.25 inches, 36 cm. Extremely Rare Japanese Set of Five Military Band Musicians from the Russo-Japanese War of 1904-5. We knew of this one-of-a-kind complete set 15 years ago, and have finally just now been allowed to purchase it. 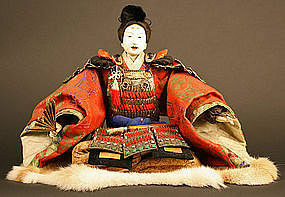 These rare sets were produced only during the Russo-Japanese War, and you will likely never see another being offered. 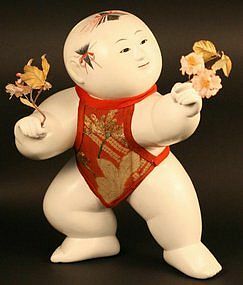 Japan used these Ningyo for the Boys Day Festival during this time in history. Heights range from 10.5 to 11.5 inches, 26.5 to 29 cm. Excellent Condition. 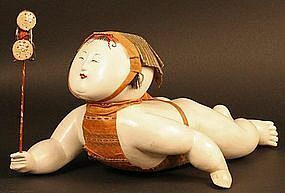 19th Century Japanese Musha Ningyô of Ushiwakamaru, the boy who would grow up to become the great 12th Century warrior, Minamoto no Yoshitsune. This wonderful Boys Day Ningyo is the rarest of all the Boys Day figures. 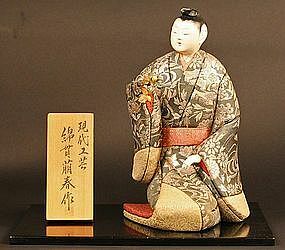 He is a fine example of Meiji Period Ningyo making. 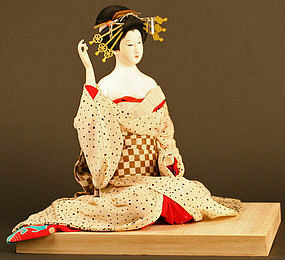 He wears gorgeous brocades and has a very expressive face. He is never seen wearing a helmet, in order to show his fantastic hairstyle. 12.25 x 16.5 inches, 31 x 42 cm. Excellent Condition. Extremely Rare Hina Kazari. This the only complete set we have seen accept for a set that was sold at auction in Japan. They are presented on a sundry. 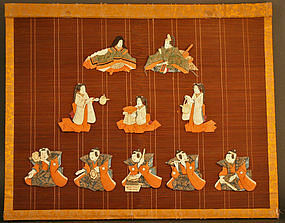 The set features an Empress and Emperor, three Court Ladies, and five Musicians. Meiji Period. Fashioned of silk crepe with beautifully painted faces. 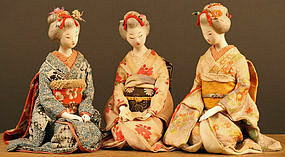 Figures range from 4 to 5.5 inches high (10 to 13.5 cm). Overall dimensions: 28.5 x 23 inches, 72.5 x 58.5 cm. Excellent Condition.